The charming little town of Nieu-Bethesda is set in the fertile valley of the Sneeuberg mountains beneath Compassberg (2502m). It is 56km from Graaff-Reinet via the tar road, the turn-off is 29km north of Graaff-Reinet on the N9 towards Middleburg. Rev. Charles Murray, the minister of the Dutch Reformed Church in Graaff-Reinet in the mid 1850’s, established the village of Nieu-Bethesda. Visitors to this area had been few and far between and through it's isolation, the village has retained its rare historical and architectural integrity. 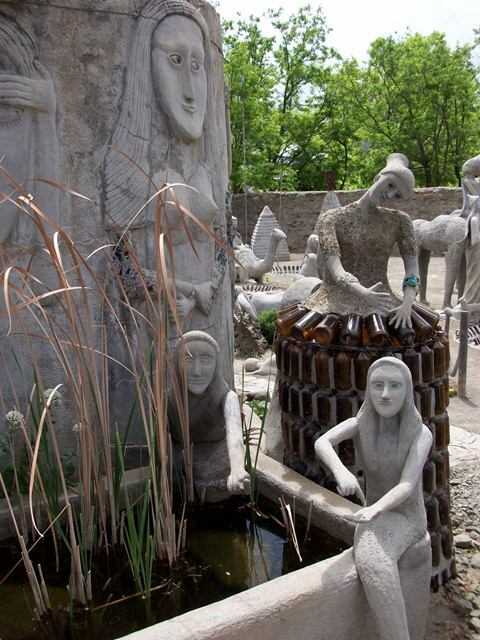 The town is popular as a retreat for artists and it’s a place that no visitor should miss. There are two alternative farm roads leading to Nieu-Bethesda, they are not recommended after heavy rains or snowfalls. Today this little artist town is a quite place, with dusty un-tarred roads and a handful of general shops. No franchises, no hotels, no modernization. However by the turn of the 20th century Nieu-Bethesda was self-contained and even boasted a school. However today the town boasts with numerous coffee shops & restaurants but few permanent residents. 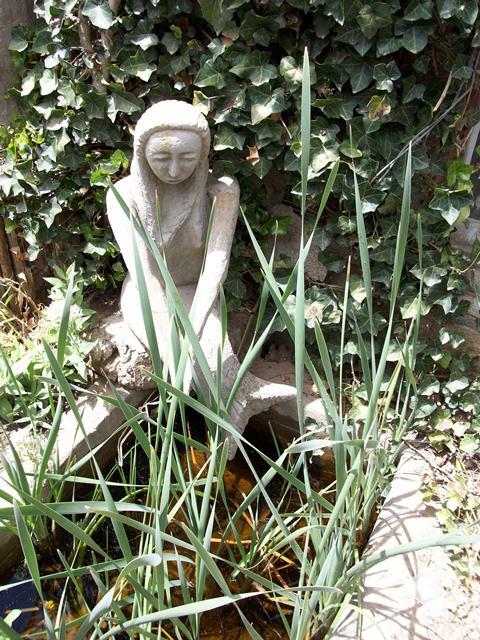 Tours on offer to Nieu-Bethesta can be booked from Karoopark Guest House. 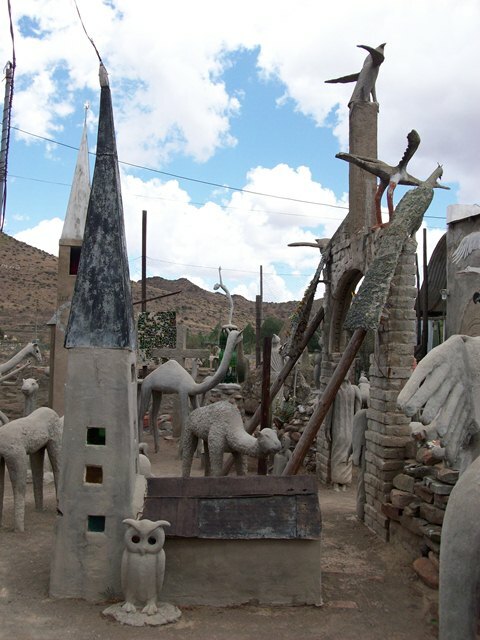 Included in the day tour is an outing to the Owl House, seeing fossils, sheep shearing and Khoi San rock paintings. If you book a tour, lunch would be provided. If you want to travel there on your own, ask for directions at reception. Nieu-Bethesta is home to the Owl House where Helen Martin lived. 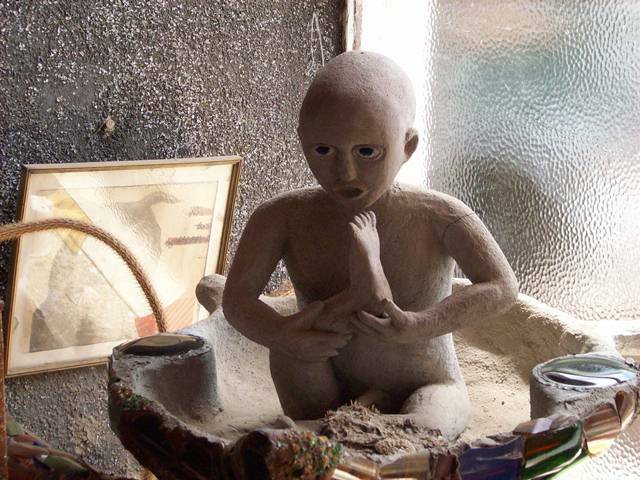 She was regarded as an eccentric old woman and lived as a recluse, devoting her life to making hundreds of figures and statues from cement and glass. 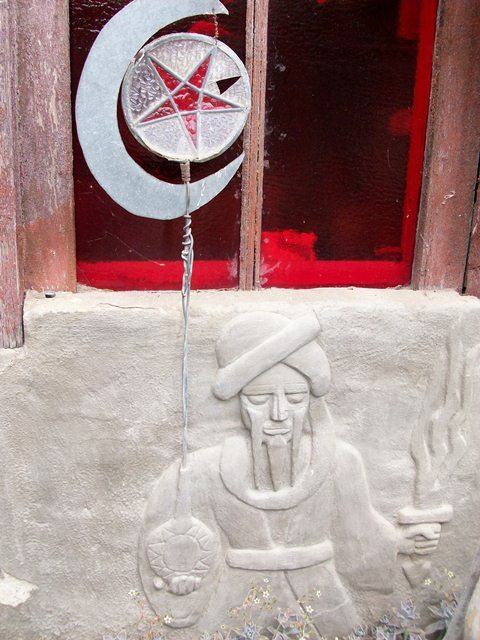 These are on display behind the Owl House in the area known as the Camel Yard. Her artistic hand had touched every space of her house. 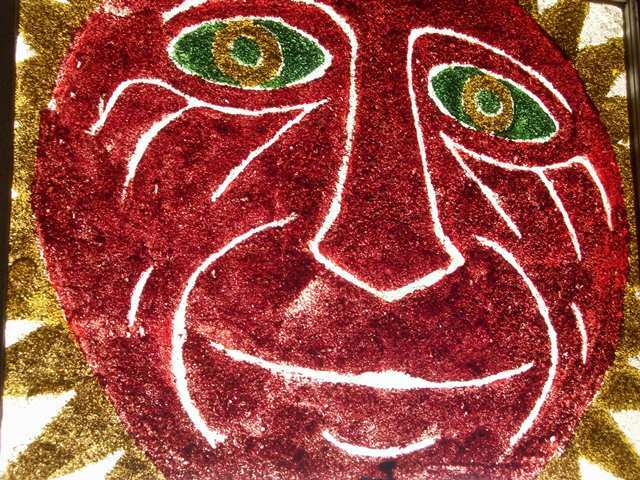 The walls, ceilings and even the doors were decorated by finely ground glass of various colours. 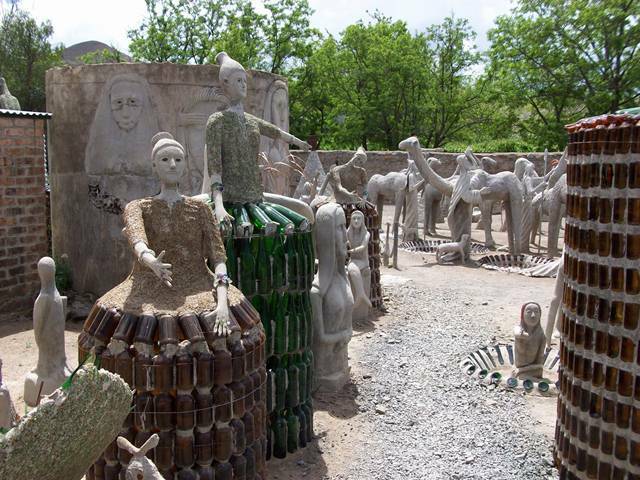 Koos Malgas was her assistant and he made all the cement statues to be found in the Camel Yard. He passed away recently and with it came the end of an era in Nieu-Bethesda. 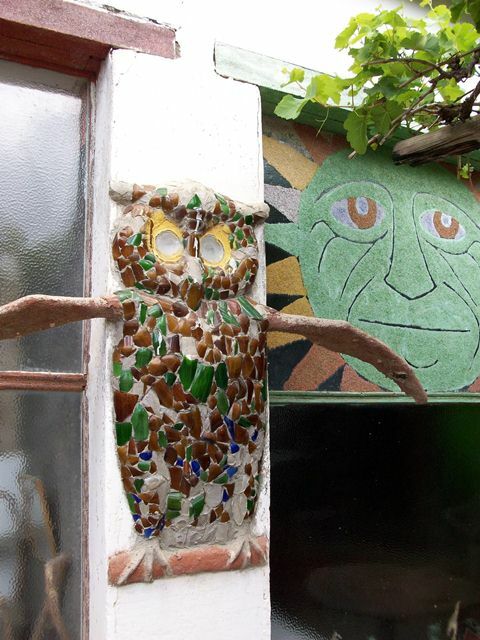 The Owl House was the name given to the premises by the local inhabitants after Martin placed owls on the roof and on the veranda to guard the house. She also fortified the area by putting up wire fencing and on top of structure owls also guarded each corner of the property. Her work provided an escape from her circumstances. She had lost her third husband, and with no more than cement, glass and paint she created a world that people today travel from a far to see. 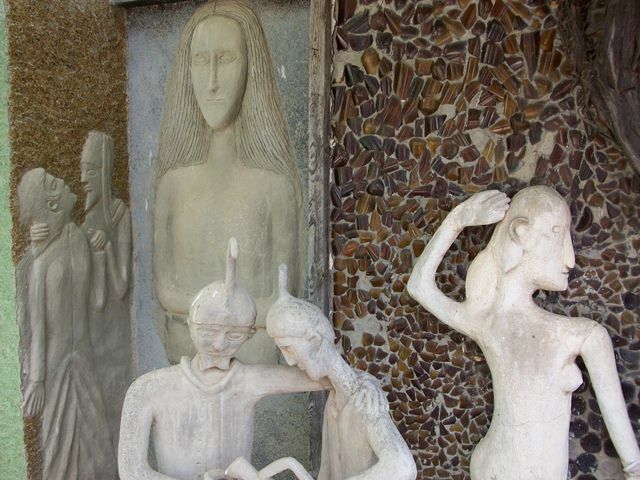 Martin was an enigmatic person and her sculptures is perceived to represent and personify her dreams. She was an artist who committed suicide when her sight started failing. However the story goes that she planned to paint the cement camels and their riders and had already brought the paint, when she took her own life. The paint is still apparently locked in the storeroom today. Numerous symbolic meanings are attached to her work. Anne Emslie explained in her book that one can understand the Owl House "as a personal Diary" of Helen Martin. It portrayed her travels to the east and all the dreams she had. But the truth is that Helen Martin lived in a remote and conservative environment, where neither her work nor her lifestyle was understood. They could not phantom why anyone would devote their life to making hundreds of figures and statues from cement and glass. Athol Fugard's book, The Road to Mecca, is based on the life story of Helen Martin. This exposure brought great fame to the little town and more and more visitors came to explore Helen Martin’s world. Nieu-Bethesda also boasts with the "2 Goats Deli" where local ale is brewed as well as various cheeses are made. It's easy to find from the Owl House, just follow the road over the river and turn left. There is a handful of places that serve lunch, so take your time and explore the dusty streets, visit a few artists' studios and if there's space in the car, buy an owl.